Following another visit to the city today this post is an attempt to at least identify, if not understand, some of the things which were such an assault on my senses and emotions. P was much admired as usual. She has become a little clingy the last couple of days, I think too many people have picked her up without so much as a by your leave and whisked her off for kisses and cuddles so it’s understandable that this has created some separation anxiety. It is beyond my capabilities to describe just how much people here adore babies. I have started trying to use this when haggling in the market, for every time they kiss her I tell them they have to knock 10dh off the asking price – no luck with this tactic so far but I remain optimistic and they seem to appreciate the joke. So anyway, we’re walking through the idyllic gardens and stopping every few minutes so someone can adore P in all her blue-eyed glory when a pretty little girl no more than 5 or 6 years old runs up to P with glee. She kisses her and P is equally taken with her admirer and runs after the girl squealing with excitement. It was a beautiful moment, despite the differences between their worlds the two of them connected joyfully in such honest mutual appreciation in the natural way that young children can. The girl then carried on her way and we saw that she was working the gardens trying to sell people tissues (for some reason there appears to be a roaring trade in tissues here). She hadn’t tried to sell any to us but watching this beautiful child work broke my heart. It seems arrogant to pity her, I have no idea what her circumstances were and I am sure there are many here and elsewhere who are far worse off. Yet coming from our western perspective of absurd privilege it seemed inconceivable that this pretty girl wasn’t enjoying the garden as a child might (or should?) but was there to earn money, a very adult responsibility. We continued but the girl stayed in my mind. I wonder whether my response would have been the same had the girl been ugly, if I am honest I think her beauty served to increase my feelings. Just because this is a common human response doesn’t make it OK, just because we’re indoctrinated by this mostly constructed sense of what is aesthetically pleasing doesn’t make that right. I think the vicinity of the mosque was a factor in the number of people begging we saw, certainly far more than in the residential areas of the city we explored (OK, got lost in) the other day. I find giving money to people who are begging awkward and embarrassing. It’s ridiculous really that I should feel this way, I have no right to the relative wealth I enjoy. It is only by chance that I am me and not you, or him, or one of them. There was a man who had cardboard strapped to his withered legs, he was very adept at getting around on his hands, dragging his legs along. He gave P a gap-toothed grin. Then there was a woman, sitting on a filthy street with a baby in her arms who was a similar age to P. I couldn’t meet her eye or her outstretched hand. 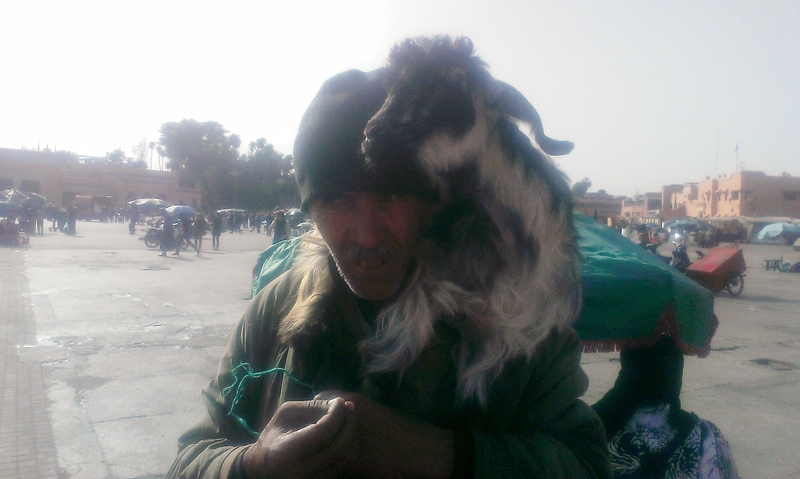 Then there was a man who looked as if he had just walked off the set of a biblical film, perhaps one about the nativity, for he carried a goat on his shoulders. We stopped to admire his goat, which bleated to P’s delight, and the man made it clear, by mime rather than words, that he was hungry. I took his photo and gave him a coin, I think it was worth about 20p. He squeezed my hand and I squeezed back, thinking of this gesture makes me want to cry. When I’m back in my comfortable life, worrying about all the silly things I do, I’ll try to remember to upload the photo of him. Perhaps the moral to this story should be that I should be less spoiled and more grateful for all that I have. In contrast to all this was the vast array of tourist tat in the centre of the old city. All those shiny trinkets which look half decent in the semi-darkness of the souk but once home you wonder why you bought it and after gathering dust for a few years eventually makes its way to the charity shop to join the ranks of tat from the Algarve and Torremolinos. The noise was immense, snake charmers piping their charges to rise up; at least ten drummers drumming; constant touting of wares in multiple languages; cries of “just look!” as they follow you down the street and play guess the nationality – the consensus seems to be that I look Belgian. As ever being abroad has brought up nationality issues for me but that’s a discussion for another day. The sights were beyond overwhelming, colours everywhere in a dazzling kaleidoscope and anything involving live snakes (or dead ones for that matter) is not my idea of fun. Some things were easy to identify, there were many orange juice sellers for instance – about 30p/glass and delicious. However it took me longer to see what was on offer from the women painting people with henna and I can only assume the man who was sitting with two live chickens was trying to sell them. The smells included food cooking, animal waste, incense, exhaust fumes and oranges, each forcing its way up my nose before I had a chance to identify where it came from and then merging into the next smell. One man, while trying very hard to sell us some slippers we didn’t want, gave P some bread he had been eating which she gratefully devoured. She also munched her way through a clementine and did her best to put sticky fingers on every possible surface including the filthy street then put her hands in her mouth *sigh*. I’m usually in favour of kids having the freedom to get grubby but there are limits and many things here have already forced me to abandon aspirations of hygiene. The traffic deserves its own paragraph and contributes greatly to the sights, sounds, smells and general insanity of the city. Motorbikes whizz past in all directions, then there’s the kalesh (horse drawn carriages), cars, bicycles (I saw a teenager pedaling with one leg only while talking on a mobile on a busy dual carriageway) and all manner of horse/donkey drawn carts and a large number of pedestrians. Every last one of them seems to have no sense of their mortality and they all weave in and out of each other with no apparent regard for any highway code. Trying to cross the road involves boldly stepping out and playing chicken between moving traffic. Nowhere is safe as motorbikes appear on even the narrowest streets. Miraculously there don’t seem to be many accidents. I think there’s scope for a study looking at the differences between Moroccan and English drivers, I’d lay money on the Moroccans having superior spacial awareness. All this sensory overload is a part of the experience, it’s partly what we came for. It is also quite easily solved as I am able to retreat to the quiet hotel room and indulge in blissful dark and silence while I write about my experiences. What doesn’t leave me is the image of the little girl’s face. I wish I had taken her photo. For me traveling is always like teleporting into another universe. Right now I cannot really imagine the reality of life at home, I know logically that life goes on there but I just can’t picture it. I know that when I return the reality of here will dim in my mind too just as the reality of all the other places I’ve been lucky enough to visit has dimmed. Perhaps that is the function of this post, to serve as an aide memoire. Incidentally it is Christmas eve today. I keep forgetting it’s Christmas. Tomorrow we’re off to explore the Atlas mountains. It is wonderful for me to be able to escape Christmas in this way (see previous post). In future P will require me to do Christmas properly but for this year we are content with our privileged ability to learn about another culture.